All year long our developers have been creating new features to add to our industry leading BackOffice, Titanium III. Each feature is built with a focus on saving customer’s time and giving them complete account transparency. We’ll be showing these features off at ITEXPO in Miami at the end of January. 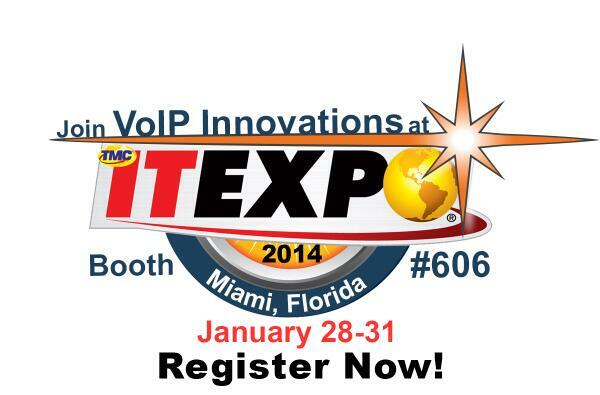 If you’re interested in talking with the rest of our VoIP Innovations Team, you can visit us at booth 606! Part of the time saving element to Titanium III is the unique Groups feature that we built. Customers can create Endpoint, DID and E911 groups and then easily assign specific groups to a Client so all information can be viewed in one location. The Group and Client features have been an attractive option for resellers because it organizes their end users into one consolidated view of services and costs. A reseller can add services to groups, add notes, edit the DID information and see their most important key performance indicators (KPIs), all without leaving the page. Titanium III was designed to be a very transparent product. We want resellers to have the best information at the exact time they want it. There should be no guess work or waiting around when it comes to managing the KPIs that are responsible for growing a business. To take account transparency and control to a whole new level, we have released two new features this year that really changed the industry. The first feature was the Customized Rate Deck. The Customized Rate Deck allows resellers to pick and choose the underlying carriers (ULC) that make up their termination rate deck. This feature gives the control to the reseller by allowing them to add and remove carriers based on price and quality. Our Customizable Rate Deck also provides resellers with unparalleled transparency by giving them the ability to view a number of KPIs in real-time. The second feature that we created in the name of transparency was the ability to see their underlying wholesale origination carrier name. We have been mulling this over for years and finally made the decision to let the reseller choose what underlying network they want their service on. This was unheard of in the VoIP industry, but we knew that this information is vital for resellers and their businesses, so we made the decision to release the carrier names. ITEXPO is quickly approaching (Jan 28-31) and we have one more trick up our sleeve that is sure to make our customers very happy. Resellers already have access to the My Client grouping system that allows them to view a combination of DID, E911 and End Point groups on one page, but their next big release will be geared toward end users. Our plan is to create an end user portal that will allow the reseller’s customers to manage their own services. This is designed to save resellers time by allowing their end users to login to a brandable web portal to make edits as they need to. They’ll be able to make changes on things such as 911 information, Fax to Email, CNAM, 411 Directory Assistance, Call Forwarding and Conference Lines. They’ll also have the ability to customize their dashboard view, much like how the reseller is able to customize their dashboards in the BackOffice. Titanium III was designed to aggregate, innovate and automate daily business and operational processes so resellers can easily and efficiently manage their accounts. Every day we aim to provide the tools that save our customers time and give them the transparency they need to continue making their business a success.